If it comes to some old-style Las Vegas excitement, Twin Spin™ has been the favourite of many players for the past years, but from the 9th of February, there’ll be a new fish in town! While both NetEnt slots offer the best of both categories, classic slots and video slots, Joker Pro™ is about to take slot entertainment to a whole new level thanks to the dynamic Joker Pro™ Re-spins and the enthralling Hot Spot Win! 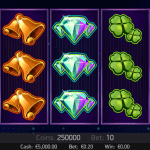 When a new NetEnt slot is going to be launched, classic or not, I’m never worried about something like a design as I know NetEnt doesn’t bring ugly or boring games to the NetEnt Casinos. The same goes for Joker Pro™ with its classic looks, but modern gameplay. 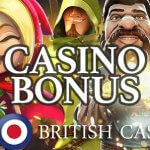 NetEnt is using old-fashioned, though modernised slot symbols such as sevens, diamonds, bells, and the well-known BAR symbol which I’ve seen before in the Twin Spin™ slot. Different to the popular Twin Spin™ video slot is the Joker symbol that acts as a Scatter symbol in Joker Pro™. But more about this attractive Joker Scatter when I tell you all about the exciting slot features available in the Joker Pro™ slot as I can’t leave the Hot Spot Win unmentioned. Even before this game is going to be available at the many NetEnt Casinos, I foresee a bright future for the new NetEnt game. I don’t know if Twin Spin™ and Starburst™ will be beaten by Joker Pro™, but I’m sure it has a good chance to become the high-roller’s new favourite. 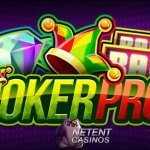 The Joker Pro™ slot is promising an outstanding design with its lucky symbols such as horseshoes and four-leaved clovers, but I’m sure players will be captivated by the few slot features this new NetEnt game will be offering and the chance to win up to 1000 times your bet! It’ll be called the Hot Spot Win triggered when three Joker symbols appear in the middle of the three middle reels during the Joker Pro™ Re-spins feature. 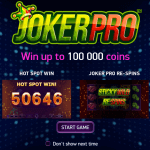 The Joker Pro™ slot is going to be all about the Joker Pro™ Re-spins, in which the Scatter/Wild has a big role to play in your chase for the Hot Spot Win. That’s kind of it, but I can assure you there’s no reason to be upset that no more slot features are involved as I’m sure you’ll be repeatedly amazed by the Joker Pro™ Re-spins feature! 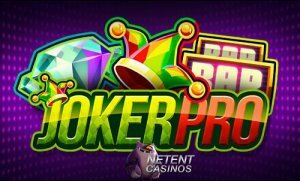 No overview of slot features this time, but an extended description of the one and only slot feature available in the Joker Pro™ slot: Joker Pro™ Re-spin. As far as I can see from the above preview video available on NetEnt’s official YouTube channel, the Joker symbol, in the role as Scatter/Wild, can appear on reels 2, 3, or 4 in the main game. If one or more Joker symbols appear, it’ll activate the Joker Pro Re-Spins. Once the Joker Pro™ Re-Spins feature is activated, reels 1 and 5 turn into Wild reels with three normal reels covering the three middle reels. This is where the action starts and the Joker Scatter/Wild is becoming more important than ever! The Joker symbols, responsible for the activation of the Joker Pro™ Re-spin feature, will turn into Wild symbols during the re-spins. When extra Joker symbols appear during the Re-spins, you’ll be awarded extra Re-spins. These same Joker symbols are incredibly important in your chase for the Hot Spot Win which will become reality when three Joker/Wild symbols appear in the middle of the three middle reels awarding you 1000 times the bet you’re playing with. Something to keep looking forward too, but we have to wait another while before we can enjoy this new, though classic, game as it will be available at the NetEnt Casinos from the 9th of February.